"How I Met Your Uncle" - Game Of Thrones parody Ep.10 + bonus. Finita la quarta stagione di "Game Of Thrones" e anche io e Marco abbiamo ultimano le strip parodia della serie: "How I Met Your Uncle". Qui, partecipando all'evento sulla pagina facebook di "Kingdom of Fantasy" potete vedere le ultime due strip realizzate per l'occasione. Restate in ascolto per alcune interessanti news! 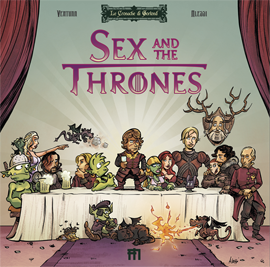 The Last episode of "Game Of Thones" is gone, and you can read the last two strip (as well with the others) of the parody "How I Met Your Uncle" signing for the free event on "Kingdom Of Fantasy" fan page. Stay tuned for the news!